Enhance your cafeteria and training environments on a budget with stackable guest chairs from the iDesk Pommerac collection. 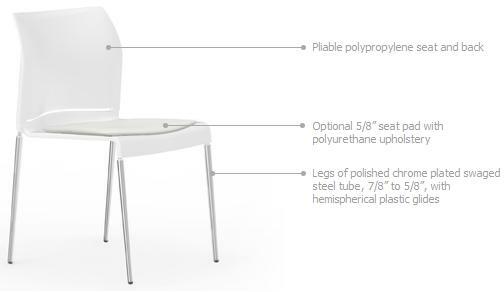 The model POM02 Pommerac series white side chair that stacks even supports users up to 250 pounds. Application: office side chair, cafeteria and training areas. Stacks 20 high on optional trolley. Legs of polished chrome plated steel tube, 7/8 to 5/8, with hemispherical plastic glides.